Cards: Score 1991, Proset 1991. 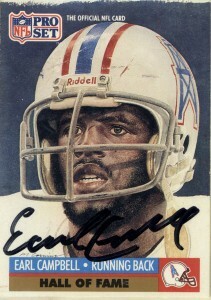 I got Earl’s autograph courtesy of the University of Texas, at Austin. I sent a picture I drew of him in all his glory with it, and he autographed these two pictures for me in exchange for the art. The other I won at an end of High School party. I met him at the CGA Youth Golf Tournament earlier in the year. He was a stocky, but huge man. His thighs were literally bigger than my waist, however he drove around in a golf cart for the majority of his time there, limited by the amount of wear he suffered from the sport. 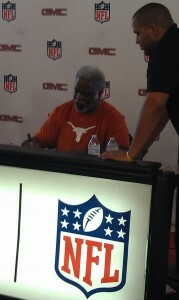 Earl Campbell won the Heisman in 1977 for the University of Texas and was the definition of ‘powerback’. 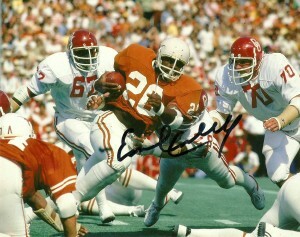 He could literally run over anybody and anything, once even stunning the Longhorn mascot Bevo after a touchdown run. The Houston Oilers, led by Bum Phillips traded to get the #1 pick of the 1978 draft and selected ‘The Tyler Rose’. They could’ve stopped drafting right there… Campbell would go on to win Rookie of the Year honors and MVP honors, while officially the Luv’ Ya Blu era in Houston had begun. 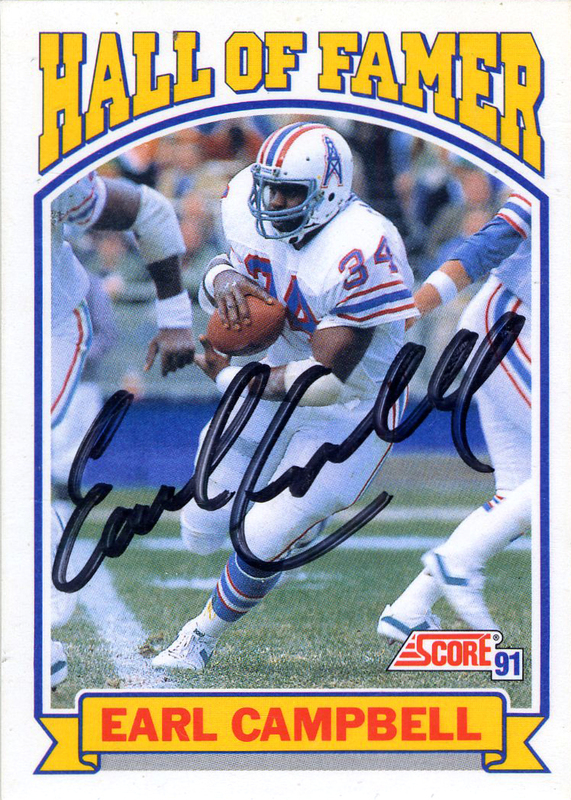 The Oilers became the most difficult opponent for the Pittsburgh Steelers that year, due in major part by the cog that was Earl Campbell. 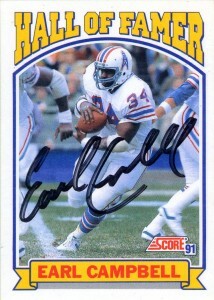 From 1978- 1985 Campbell dominated the rushing charts racking up 5 Pro Bowl selections, 3 All Pro selections, 3 offensive player of the year honors, and NFL MVP in 1979. 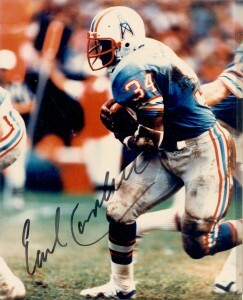 During his 1980 season Campbell ran for a career high 1934 yards, while over the first 4 years of his career rushed for almost 6500 yards and 55 touchdowns. He punished defenders across the board with his rugged play, but by 1982 it began to take a toll on his body. In 1984 he found himself traded to the New Orleans Saints to play for his old coach and mentor Bum Phillips, where he retired after the 1985 season. Campbell since football has conquered a variety of issues as he has dealt with back pain and injury from his playing days but he has managed to reforge himself as a successful businessman. 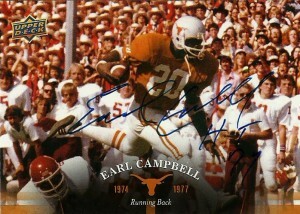 UT utilizes him also as an ambassador and Earl has had success with his own meat and BBQ company.